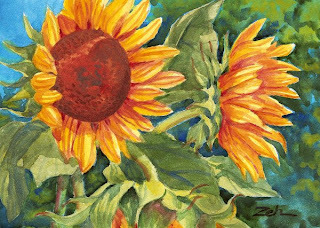 Certain flowers prove to be favorites among art collectors and sunflowers definitely belong to that group. So, here they are again after more requests have come in for these bright, shaggy-headed giants. The sunflowers in this area have gone to seed by now. The birds are happy about this, as sunflower seed is a big favorite with those that hang around all winter. They are excellent sources of nutrients to help birds survive a long, cold winter. Speaking of cold, it has not yet become cold here. It has really not gone much below 60 degrees F causing speculation that New England will be the new Florida before long. Say it's not so. I love winter. What would it be without snow? It's funny to listen to folks here. They usually gripe about the cold, but, now that it's not cold when it should be, they gripe about that! Can't please them.